Who is calling me from this number? Find out the unknown caller here! Who is calling me from this number? Sometimes, you wish that Caller IDs would simply work even for numbers that you do not know, or have not seen before. Wouldn't it be great, if the name of the personal just magically popped up and save you all that trouble of picking up? Today, it is actually possible to 'decode' or 'reveal' the identity of the caller behind a phone number. Some people do not know the correct term used and simply call it 'check phone number'. The process is actually called Phone number lookup or Reverse phone lookup. So, what does Phone number lookup do? Does reveal a phone number location on a map? Does it help you to physically track phone numbers for free? While getting the location of someone without his consent is a complete invasion of privacy, it is a common misconception and actually not the point of a Phone number lookup here. Phone number lookups, or reverse phone lookups, helps you to answer the question of "who's telephone number is this" when you receive a phone call from someone you did not know. In other words, it can reveal a name of a person behind a given phone number. It is actually very simple to operate too. To perform a Phone number lookup, you can download a reverse phone number lookup app and perform a search using a phone number. If the number is valid, i.e. does not have missing numbers, or follows the correct format, chances are you are going to get a pretty accurate search result. 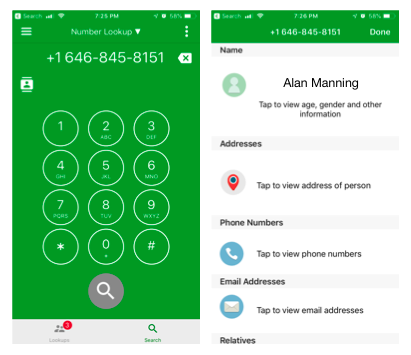 A good and accurate apps to use is Look Up - Reverse Phone Lookup by Appsverse, which has an above 90% accuracy rate for phone number lookups, and even works around the world too. To look up a phone number, you can open the app and do phone number search. Within seconds, it should come back with a search result which is a name of a person. There is your answer to the question "who's telephone number is this?". It even works for commercial numbers, numbers that were usually blocked by being removed off 'do not call' lists and more. Reverse phone number lookup is also useful in situations where you are receiving spam calls and want to find out who is calling me from this number first before deciding whether or not to pick up. Wondering how do I reverse lookup a phone number for free? Look Up - Reverse Phone Lookup by Appsverse is also free to use in case so you can immediately start to perform lookups once you have downloaded the app. What would the future of privacy look like for internet users?